The muscles that bend (flex) the fingers are called flexor muscles. 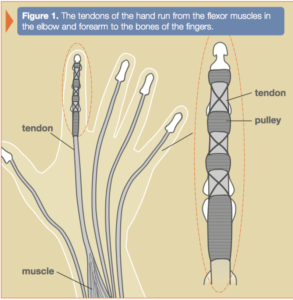 These flexor muscles move the fingers through cordlike extensions called tendons, which connect the muscles to bone. The flexor muscles start at the elbow and forearm regions, turn into tendons just past the middle of the forearm, and attach to the bones of the fingers (see Figure 1). 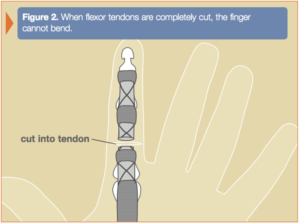 In the finger, the tendons pass through tunnels that keep them close to the bones, which helps them work better. Deep cuts can injure the tendons and nearby nerves and blood vessels. An injury that looks simple on the outside can be much more complex on the inside. nerves and blood vessels may need to be repaired as well. 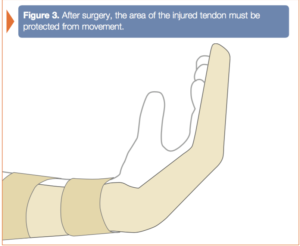 After surgery, the injured area will need to be moved to limit stiffness, but the repair must be protected (see Figure 3). In most cases, exercise is done by having you move your fingers with your other hand, but you are not allowed to try to bend your finger on your own for about a month. You must wear a splint for at least a month after surgery. These exercises can be tricky and a hand therapist can help you. These exercises can vary among surgeons; your surgeon will direct your care. There is scarring as the tendon heals, and most people do not regain normal motion. In some cases, if motion is less than expected after months of exercises, then your surgeon might offer you surgery to release scar tissue around the tendon.